Dianne Minnaar is a professional artist and calligrapher who has focused almost exclusively on creating sacred images in recent years. She wanted a site to not only display her work, but also to give people the opportunity to comment on each piece and to create a story around each one, and also for people to able to buy prints if they desired. With new pieces being created all the time, the site needed an easy to use content management system, so I chose ExpressionEngine. 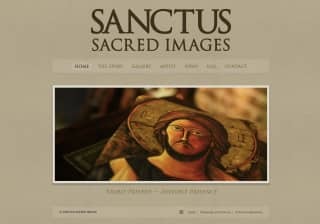 The site also needed to be capable of e-commerce to take orders for prints of the artwork. 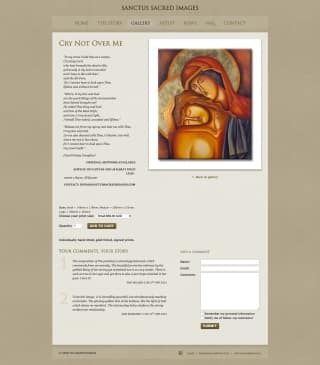 Site visitors can leave comments on the artwork which are moderated before being published. It's been a pleasure working with John. He understood our requirements and "made it happen". We're very happy with the end product. John handled everything very professionally and responded promptly to our many questions. Our experience was in line with what was promised (in fact you exceeded our expectations). That counts for a lot, because talk is cheap.